Since its establishment, the Irish Institute of Pensions Management (IIPM) objective has been to promote professional standards for those working in pensions industry, with the highest possible education standard being central to the achievement of this objective. We are delighted to announce that the part-time course the Diploma in Pensions Management and Policy is now delivered using a blended approach with traditional and online classes. Half of the programme is delivered in a classroom format with the second half delivered via blended learning. Blended learning means you attend the majority of your lectures online from the comfort of your home or office, with a small number of in-class lectures. 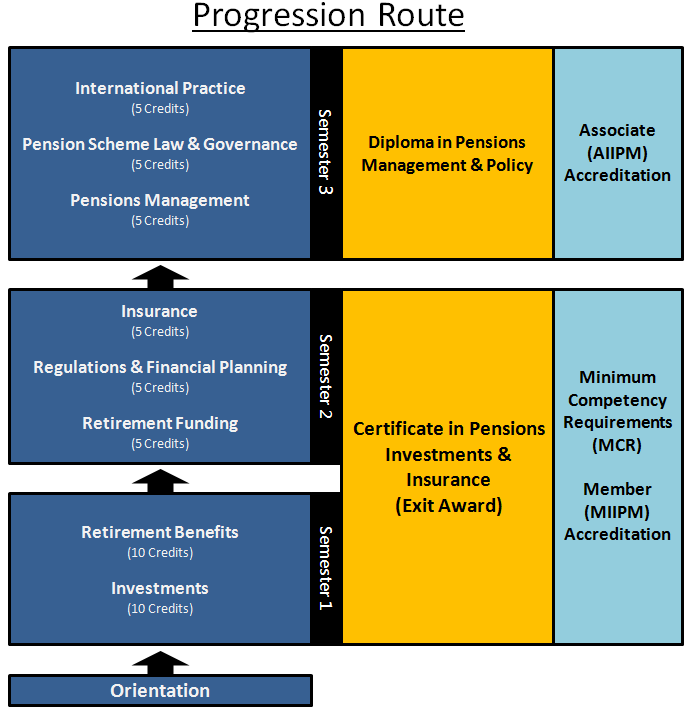 In continuing to meet this objective, the existing IIPM Membership and Associateship professional qualifications have been redeveloped and in collaboration with the National College of Ireland (NCI), both qualifications have been approved by the Higher Education and Training Awards Council (HETAC) and placed on the National Framework of Qualifications within the Diploma in Pensions Management and Policy (Special Purpose Award HETAC Level 8 award – 60 ECTS). This change was carried out to ensure the IIPM qualifications continue to meet the minimum competency requirements of the Central Bank and in response to the increasing requirement & need from the pensions industry for accredited courses on the National Framework of Qualifications. In 2010, the Central Bank carried out a review of the Minimum Competency Requirements (MCR) and the conditions attaching to a “recognised qualification”, was amended to include the additional requirements for all professional bodies to have their underlying qualification included on the National Framework of Qualifications at level 7 or higher by 2011. Increasingly, employers recognising educational achievement as a key requirement for their staff are seeking qualifications accredited at the highest levels on the National Framework of Qualifications. Hence the IIPMs objective is to have all Member & Associate graduates holding a Level 8 Award on the National Framework of Qualification, validated by HETAC. Graduates of the Diploma in Pensions Management and Policy will develop the knowledge, competency & technical skills at level 8, ensuring that their qualifications are appropriate for employees who wish operate in the pensions or financial services industry in a senior advisory, technical or management role.